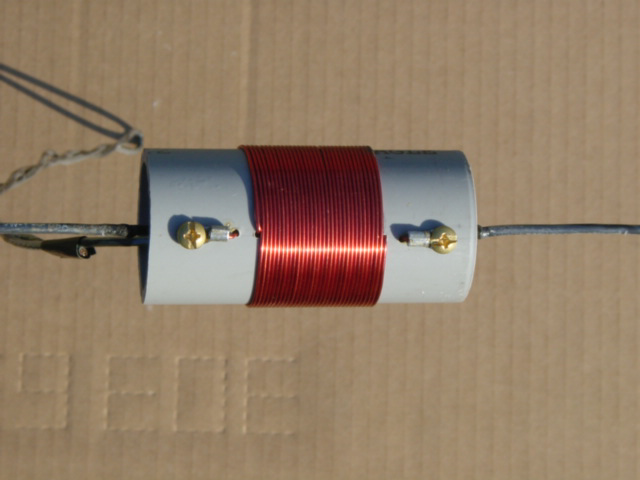 Ham Radio 20 / 40 Meter Short Coil Loaded Dipole Antenna | The Wonderful World of Microcontroller! The Experiment: In this experiment were going make a Ham Radio 20 / 40 meter short coil loaded dipole antenna. The goal will be to keep the total length under 40 feet so that the dipole can be mounted on two 20 foot fiberglass pole to make a 20/40 meter rotatable dipole. 1-1. Cut Two 3.450 inch coil forms of the 8 foot 1-1/4 underground S40 rigid PVC conduit. 2-1-1. Strip back 2″ of insulation on one end and 1/8″ of insulation of the other end. 2-1-2. Solder a ring terminal connector the the 1/8″ stripped end. 2-1-3. Slip a ring terminal over the 2″ end with the loop out, bend the 2″ end back on the ring terminal, then slip a spade terminal on the 2″ striped end and solder both terminal to the #14 wire. 2-1-5. Strip back 1/8 of insulation. 2-1-8. Strip back 1/8 of insulation. 3-1-1. Install 15 foot element to the Dipole Center Tee Connector 2″ stripped end to the connector. 3-1-2. Install the loading coil to the ring terminal on the 15 foot element, also connect the ring terminal from the 2 foot element to that terminal. 3-1-3. Install the ring terminal from the 4 foot element to the other end of the loading coil. 4-1.1. Measured from the ring terminal, Set the 20 meter 2′ #14 sub to 1(one) foot 7(seven) inches. 4.1-2. Measured from the ring terminal, Set the 4′ #14 40 meter section to 3(three) foot 9(nine) inches. 5. 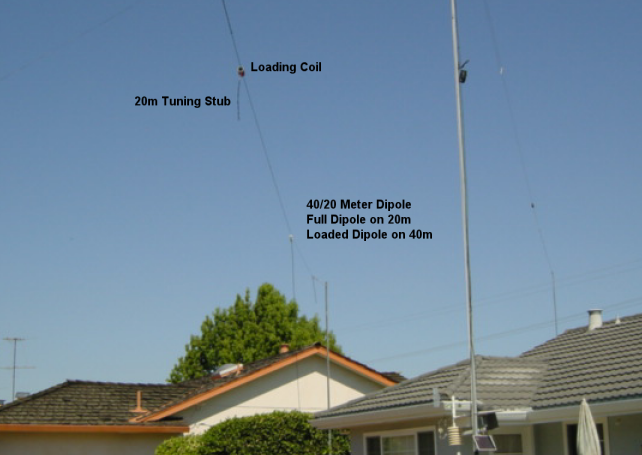 Install the 20/40 meter dipole 20 feet off the ground and check the SWR for each band. Adjust the 20m stub and 40m section for low SWR at Center frequency. Note: After tuning the 20 meter section and the 40 meter section. 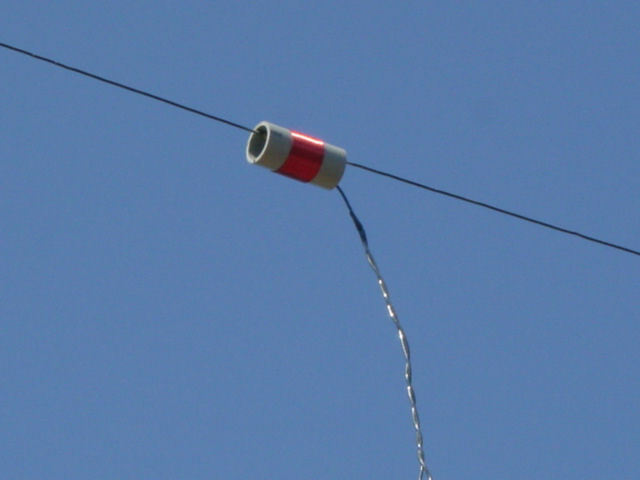 The total length of the prototype 20/40 meter coil loaded dipole was 38′ 2″. Off coarse this will very at different locations / heights. 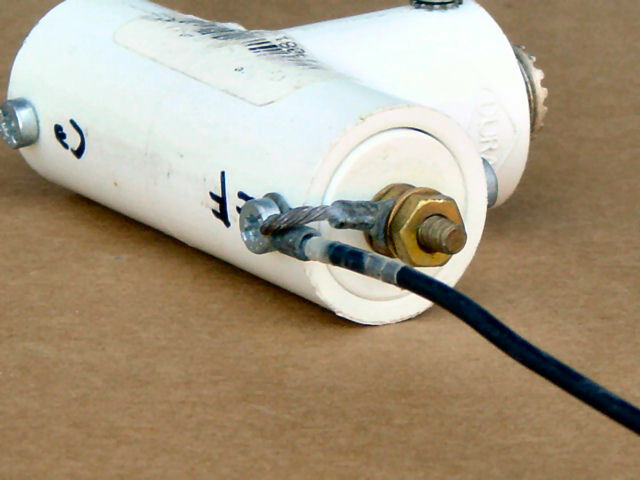 The link to the Dipole Center Feed Connector Build. This is is how the 15′ element is connected to the Dipole Center Feed Tee Connector. Photo Showing the Loading Coil / 20m fine tuning stub. Was surprised to see how well the 20/40 meter coil loaded dipole worked up at 20 feet , on 20m 1.0 to 1.5 SWR from 14.000 to 14.350 and 40 kilohertz spread at 1.6 SWR on 40m. Performance compared to the 40/80/20 coil loaded fan dipole center up at 32 feet was much better on 20 meter and good on 40 meter.